A bit more dignified, after I had rearranged him to look a bit less dead.. The fade to black in the background wasn’t intentional, but I like it! A ventral (stomach) view. This species is quite easy to confuse with a harvestman (related to spiders, but not spiders), if you don’t know what to look for. To tell harvestmen from spiders, look for the join between the thorax (the body segment with legs) and the abdomen (the segment that doesn’t have legs). If you can see the join clearly where there is a “pinched-off” section then it is a spider. Harvestmen have fused segments so that it looks like the thorax and abdomen are one. Now that that’s over with, this week I wanted to try out a new toy. I had been hoping that my new light box would arrive for last week’s macro attempt, but the package didn’t arrive until this Monday so I decided to give it a go this weekend instead. 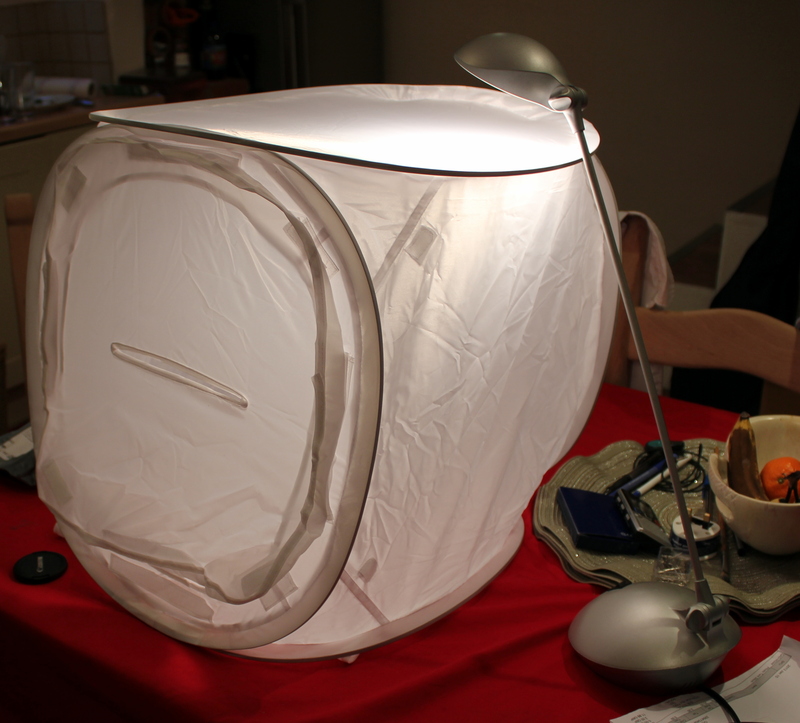 It isn’t really a lightbox – in fact it looks more like a laundry hamper (see right) – but it does the job of slightly diffusing external ambient light sources to reduce shadows, as well as reflecting internal light sources to diffuse that light as well. It’s not great, but then it only cost £12, so I thought I would give it a try! The next thing to do was to find something to put in it. Luckily, I can track the progress of spiders through my house by the complaints that I receive from the girlfriend. By her reports there were at least a million in the downstairs cupboard, just waiting for a chance to crawl in her ears and die (I might have to get her a pair of these). 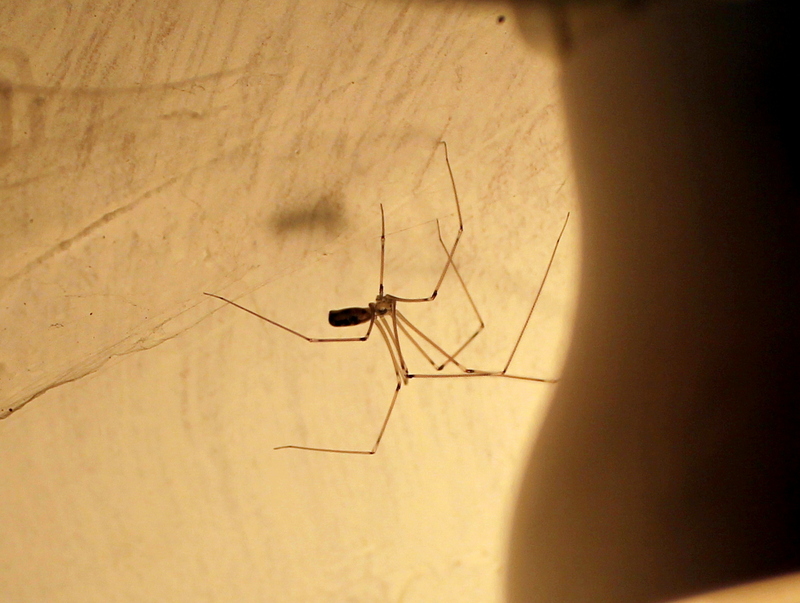 Anyway, as soon as I opened the door I saw what I think is a Pholcus phalangioides (daddy longlegs spider) just inside. I’ll write a bit more about the natural history of this species later, otherwise this post is going to get long! I wanted a clear photo, but Dave (all insects are called Dave) had long legs and moved quickly so I didn’t fancy my chances of getting him into the lightbox without him escaping. 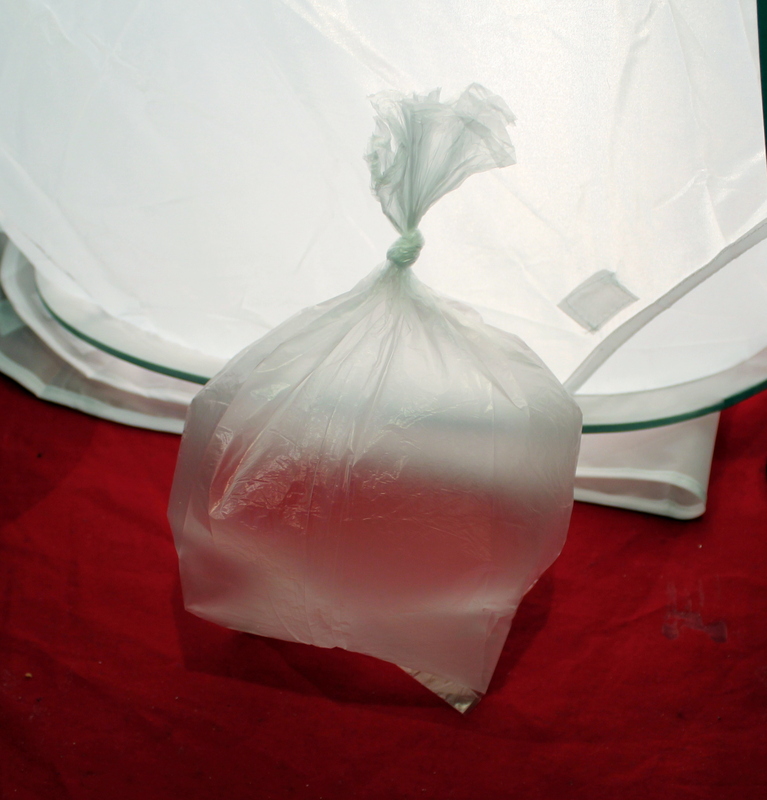 Instead, I used a little trick that I have used on damselflies in the past: drop the critter in a zip-lock bag and stick him in the freezer for a minute. Usually I would have popped him in the fridge, but I was impatient and I wasn’t too concerned about him snuffing it (apparently they form large colonies, so there are probably a lot more Daves where Dave came from – just don’t let the girlfriend know…). Depth of field – one thing that was bothering me about these photos was that I could focus on the head/thorax, but not on all the legs. The “Av AE” (aperture priority auto-exposure) setting should have allowed me to alter the depth of field to change between focusing on one component of the image with the back- and foreground blurry (narrow depth of field, a low “f” value) or a sharper foreground and background (wider depth of field, a high “f” value). Unfortunately I think there was just a little bit too much variation in the focal distances, and the camera couldn’t compensate. It’s something that I will try again when I’m not doing macro shots, though. White balance – as with last week’s photos, the light was a bit peculiar in my basement kitchen. Setting the white balance manually by photographing an empty patch of white background really helped this. Light source positioning – I had thought that a bright light shining from outside the lightbox would diffuse through to give me sufficient light throughout the images. However, the pictures came out grainy when I tried this and so I resorted to moving the halogen lamp into the box itself, positioning it just a few centimetres away from the object. After resetting the white balance this made a big difference to sharpness. Things I learned: White balance is important (again). I need to have more of a play with the depth of focus. Now that I know how to alter it, I will try it out in different situations to see if I can get an effect. Finally, the lightbox is a nifty little thing for making images brighter. It is certainly well-worth £12 for the sake of having something to help with indoor lighting (especially when you tend to do photography in a basement, like I do!). Also, you should GO READ CARLEY’S STORIES! Carley, my partner, has (unbeknownst to me) been taking a photo each week and writing a flash fiction story around that image. She already has stories for the first three weeks of January up on her blog!